Every woman wish to have a silky smooth skin, which makes them more beautiful and confident. ​Today epilators have fast grown to be a woman’s best companion for achieving and maintaining a radiant and gorgeous hair-free skin. An epilator is a compact, portable and ergonomic device that pulls the hair from the root giving you a smooth silky skin for many weeks. With a best epilator for women, you no longer have to worry about your body hair whether you are on a business trip or on a beach holiday. Epilation has become one of the most effective and convenient methods of hair removal. By using an epilator you get better lasting results and don't have to worry anymore about shaving daily. Waxing is another popular method which gives good results when done by professionals, but going to a salon every couple of weeks can quickly dig into your purses. Using a ﻿﻿﻿wa﻿﻿xing kit is another option you have ,but an epilator is way more convenient and cheaper in the long run. Laser hair removal is also effective, but is a more expensive process making it less popular. Epilators can be painful at first, but with regular use the pain becomes tolerable. They can remove hair as small as 0.5 mm that is 4 times smaller than done by waxing. The hair that grows back is softer and thinner making it easy to manage. Epilation may be time consuming to begin with, but with regular practice and using higher speed settings you can save time. With many brands and models available today, it can be a daunting task to choose the right one suiting your budget and needs. If you are searching for your next epilator, then look no further! Check out our epilator reviews, featuring top models and brands that are best-selling and worth your money. When it comes to choosing an epilator for your needs, factors to consider are price, features, durability and ease of use. We review 5 epilators that have consistently received the highest consumer ratings and the top-selling models. Braun is the top-selling manufacturer in the grooming industry with a wide variety of innovative and powerful products that have become the market benchmark. Their epilators may be more expensive, but offer excellent quality and you can enjoy hassle-free operation. 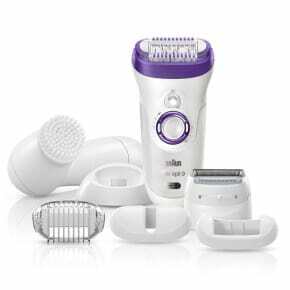 Braun Silk Epil 9 is arguably the top rated epilator for women from Braun. Silk Epil 9 has 40 tweezers placed on a 40% wider head. The wider head along with a micro-grip tweezer technology gives you a long lasting silky skin up to 4 weeks. The epilator is cordless and a rechargeable battery gives 40 minutes of operation with 1 hour of charging. You can use it in shower as the Silk Epil 9 is waterproof. A smart LED light makes it easy to spot all the unwanted hairs. You can adjust the speed with its dual speed dial giving you greater control over epilation. The kit consists of a charging stand, high frequency massage cap, shaver head, trimmer cap, skin contact cap, facial cap and a facial brush. The wider head of the epilator removes more hair per stroke for faster epilation and also makes it less painful to use. Silk Epil 9 has a pulsating high frequency massage system that provides extra gentle sensation, making the epilation more comfortable. A pivoting head gives a smoother and efficient operation by adapting to the body contours. The shaver head can be used for getting a close shave and the trimmer cap helps you to trim the hair to desired level before epilation. The skin contact cap can be used for underarms and bikini line areas. Another useful attachment is the sonic exfoliation brush that removes makeup and clean the pores 6 times better than manual cleansing. The facial brush along with the facial cap makes it suitable for removing facial hair. As a safety measure, you cannot use it while charging. The Braun Silk Epil comes at a higher price tag, but considering the flawless performance, features and attachments makes it worth every penny. Braun Epil 7 was the most advanced and popular series from Braun till the launch of Braun Epil 9 series. The Epil 7 is still one of the best-selling epilators. It features 40 tweezers and uses a close-grip technology to remove even the shortest hair. The wet and dry feature is also available along with a built-in smart light. The cordless epilator will give 40 minutes of epilation with 1 hour charging. There are many useful attachments included with the epilator like shaver head, trimmer cap, facial cap, sensitive-area cap and an efficiency cap. Pre-epilation wipes are also provided along with a travel pouch. Efficiency cap reduces the time for epilation as it removes more hair per stroke. The trimmer cap helps to trim the hair to optimum lengths (2 to 5 mm) required for a smooth epilation. The pivoting head adapts to body contours for good skin contact and gentle action. A high frequency massage system stimulates the skin for maximum comfort. There is also a facial cap designed for epilating facial hair. The sensitive-area cap attachment can be used for underarms and bikini line areas. Silk Epil 7 is great for underarms as it can get rid of armpit hair efficiently by using the sensitive-area cap without causing much pain. The above braun epilator reviews underline their expertise in making quality innovative products and should be one of your first choices. Emjoi is one of the recent manufacturers of epilators but have quickly risen as one of the top epilator brands. The Emagine AP-18 from Emjoi is the most powerful epilator in the world featuring 72 tweezers. It removes more hair quickly and comfortably with each pass which makes it the most suited epilator for legs. Another feature we liked is the patented glide technology, which has one fixed tweezer head and another two which open and close to increase comfort and reduce irritation. It is also the first epilator to feature silver ion technology that provides antimicrobial protection. The Emagine has an innovative technology to prevent ingrown hairs with middle lifting fingers that raises short or flat hair for easy epilation. It has dual-opposed heads which hold the skin tight and cover more area to remove hair the first stroke itself. It can remove armpit hairs from your underarms, specially for those with thick hairs in that region. The Emagine has 2 speed settings for flexible usage. Some of its drawbacks are that it is neither cordless nor waterproof and has no built-in light. Also as there are no special caps for face or bikini areas, it is better to use on body parts before moving on to sensitive areas. You can also expect more pain due to a larger number of tweezer heads pulling on your hair at the same time. If you are looking for the most powerful epilator then Emagine is the right choice and comes at a decent price. Phillip﻿s is an innovative and reliable Dutch electronics brand that makes good epilators. They have small and economical models that does the job efficiently. The Philips Satinelle HP6401 is the best cheap epilator that gives good results as well. It features 21 hypoallergenic discs, and a removable washable head for hygienic hair removal. The body is small and its ergonomic design allows you to hold it with ease. It is a corded model with 2 speed settings. It comes with an efficiency cap for use on delicate skin areas and gives you a gentle and effective epilation. For those new to epilation, the efficiency cap can be used for bikini areas and underarms. The Satinelle cannot be used in water and has no built-in light. It is not recommended for use on facial hair. One drawback we observed is that due to lesser number of tweezer heads, the epilation power is less and you may have to run it a few times to get the desired hair removal. The Satinelle is perfect for beginners looking for an affordable epilator. 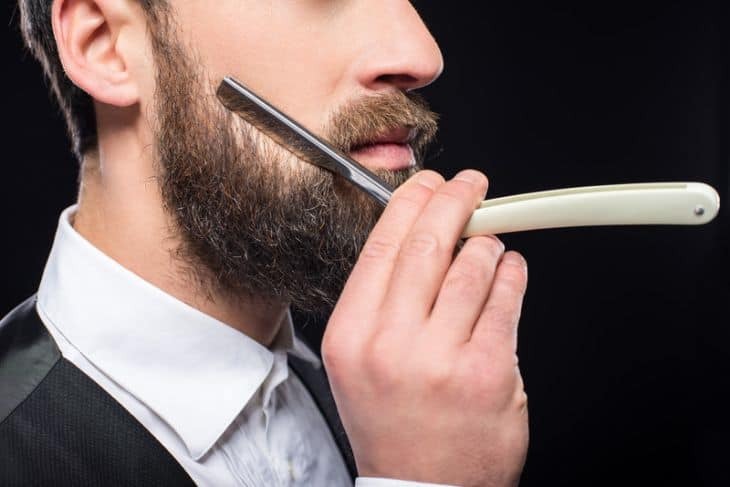 As there are no extra attachments available, those who are looking to trim as well, will have to get an electric shaver or razor. Panasonic is a Japanese brand is known for their solid build quality and endurance. ES-ED90-P is a fully featured top-selling model from Panasonic and is one of the top epilator for Brazilian. The epilator has very good features and additional attachments to help you get that perfect Brazilian in the most comfortable way. It features a dual-disc epilation head with 48 precision tweezers that removes more hair with least discomfort. The large flexible pivoting head can move up to 30 degrees forward and backward for ultimate smooth operation. To get a good Brazilian shave, you will need to trim your bikini area first. For this you can use the additional shaver head along with the bikini comb to first trim the hair to desired level. There is a separate compact gentle epilator head which can be used for bikini areas and sensitive areas. The additional gentle epilator head allows you to epilate bikini areas with least pain or irritation. For beginners, a gentle epilation cap is provided to be used on the dual-disc epilator head. It also has a pedicure buffer, so far not present in any other epilator brands that can remove dry, callous skin from your feet. The blades and foil are hypoallergenic for irritation-free shaving. It is a wet and dry model, providing 30 minutes of operation with one hour of charging. Also it comes with built-in LED light and support dual speed modes. One major drawback is that it cannot be used for facial hair. The Panasonic ES-ED90-P is the best rated epilator for bikini areas. But if you don’t want to epilate sensitive areas, you can choose the best alternative from our list of the best bikini trimmer or ﻿shavers﻿. It was the first brand to launch an epilator and has ever since known for its innovative designs and market changing features. They are still making good epilators in all budgets and is based in the USA. The Epilady Legend is good rechargeable model and the other popular model Epilady Esthetic is a delicate facial epilator. It is another popular American brand that has been making quality epilators. They feature handy designs and have many popular models. The popular models are Remington EP6010 a corded dry model and Remington EP7030 a rechargeable wet and dry model. There are mainly three different types of epilators depending upon the technology used for hair removal. It is essential to know the different types and their features before buying the best suited for you. ​They were the very first epilator models which consisted of a bend coil spring. The springs are tightly pressed together on one side and apart on the other side. The motor rotates this spring, which flexes it and picks up hair when moved along the body. The springs used to fail due to constant flexing and can be replaced separately. These types are now hardly in use. ​This type of epilators have a set of rotating discs on top of the body seated in a plastic housing. The hairs are pulled out by the tip of rotating discs similar to tweezing. The disc type give a massaging effect and they come with feature like anti-microbial protection, gold plated disc and pain reduction technology. These are the latest type of epilators and they are similar to the disc types that instead of rotating disc they have series of metal plates enclosed in a plastic housing. As they rotate the tips move closer and apart pulling the hair and then releasing them. Tweezer epilators are the most popular type now .They come with as much as 72 tweezer heads giving a wide coverage. They also have anti-microbial protection, pain reduction and also prevent ingrown hairs. We list here the important features to look in an epilator. • Target Body Area - Epilators are available with different attachment heads and caps specifically designed for use on different parts of the body. The underarm and sensitive areas need narrower heads compared to wider heads for full body. There are epilators designed only for facial hair removal. They can remove hair from face areas but if you want a solution for facial hair issues like nose and ear hairs, it is better to consider a nose trimmer. • Wet and Dry Modes- Epilation is more effective on dry skin as hair can be pulled out easily. Wet mode enables you to use it in your shower. The advantage is that hot water opens up the pores easily and reduce the pain during epilation. Also keep in my mind all wet epilators will be cordless to be used in water. • Cordless or Corded Operation - Cordless types can run either with a normal battery or a rechargeable battery. Battery models are cheaper, but rechargeable ones are beneficial in the long run. Corded models are easy on pocket and you don’t have to worry about buying batteries or charging before use. • Built-in light - Many of the new models now feature a built-in Led light on the epilator body. It is useful in spotting hair while epilating and get a uniform result. With an LED light you can epilate easily in low light rooms or in a shower. • Tweezer Heads - More the number of tweezer heads, more effective the epilation so check for the number of tweezer heads available. Most models has an average of 30-40 tweezer heads, but models with up to 72 heads are also available now. A higher number of heads will also increase the pain during epilation. • Extras–Features like massage system, antimicrobial protection, hypoallergenic blades, and gold plated heads are useful features if you are having a sensitive skin. Other attachments like shaving and trimming heads help to reduce the hair length before epilation. Epilation can sometimes be a painful experience, especially for first-time users. Watch this video for tips on ﻿how to epilate smoothly and get a silky hair-free skin. ​You can follow these tips for a smoother and less painful epilation. • Regular Epilation - Do not let your hair grow back to more length by ensuring regular epilation every 2-3 weeks. In case the hair has overgrown, use a trimmer or shaver to trim them to 2-5 mm length to get a smooth epilation. If you are doing epilation for the first time, you should wax or shave a few days before epilating. The regrown hair will be weaker and thinner and less painful to epilate . • A Good shower- Showering opens your pores and helps to remove the hair with lesser pain. It also removes dirt and creams from your skin and makes hair soft. If the model is wet and dry, it becomes easier to use in the shower. • Exfoliation - Exfoliation is an essential step to prevent ingrown hairs and reduce the pain. You can do it one day before epilation using body scrubs, salts, loofah and exfoliating gloves. • Tight Skin- While epilating you should hold your skin taut, as it can grab the hair easily and for underarm areas you should raise the arm behind your head. Always hold the epilator perpendicular to the skin and move in the opposite direction of hair growth, to lift the hair for smoother epilation. • Speed Levels - Most epilators come with a slower and higher speed settings. The lower speed is less painful and you can go for higher speeds once comfortable. • Creams and Cooling pads- You can try numbing creams like lidocaine or greencaine to numb areas like legs or arms to make you feel no pain. You can also try cooling pads after epilation to soothe any irritation or discomfort. Epilation should be done at night as any redness caused will subside by morning. You can now easily choose an epilator that meets your requirements from our epilator reviews featured here. If you are still having second thoughts on epilation, we assure you it is one of the best ways for getting a smooth hair-free skin. The Braun Silk Epil 9 -9579 is our top choice as it offers excellent results and quality product that gives long lasting hassle-free performance. Just pick one from our list of the best epilator for women and start epilating from today! We hope you have a good experience and will not have to consider any other ways for a beautiful skin than epilation! Hey, I love your article, I’m thinking of going with braun epil 9 and noticed you mentioned it. I keep reading reviews about it but can’t make up my mind because of the price. I understand it has a ton of features compared to the philips epilator but the price seems a lot. After reading this review I can kind of justify the price but then again in this review they keep on praising braun too much and I feel like they were being biased. I really wanted the opinion of an expert who can tell me approximately how long the braun epilators run for in the shower? I know you mentioned the approximate run time is 40 mins but is that the same if we use it in the shower?